Well, another year has come and gone, and I like to think that I am becoming more of who I was meant to be. Not sure what I will do today to celebrate, but will try to do something fun and different. My lil peanut is out of school today, so the "team" will have no trouble searching out something worthy of us, lol! Hey Kelly, happy birthday and nice to know you! Have a wonderful day. Kelly, I hope your birthday--and every day--will be special in every way! I'm someone who loves my birthday and continues to celebrate each one over and over with different people! My last one--my 70th--was really special. My coworkers decorated my office with paper cutouts of diet coke in the shape of a huge 70! Loved it! Happy birthday! 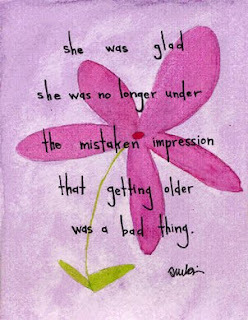 Love the quote - I had a long chat with my 8 year old niece about aging over the weekend. She's already concerned that she'll never be seven again - and that's very sad to her. Thanx everyone, I woke up to a serenading 4 yr old, and all these b-day wishes :) What a nice way to start my 37th year!!! Happy Birthday! Hope your day is blessed! Thanx everyone for your blessing and cheer. Don't ya just love birthdays?